ITMHCA is proud to be a founding member of the Alliance for the Advancement of Infant Mental Health. State Infant Mental Health Associations that have adopted use of Competency Guidelines® and the Endorsement for Culturally Sensitive, Relationship-Focused Practice Promoting Infant Mental Health® are members of the Alliance. Participation continues to grow within the US and internationally. ITMHCA remains involved in growing the Alliance, specifically through ensuring fidelity to the Endorsement® process, developing progressive media strategies, and moving infant mental health related Policy issues forward. As a member of the Infant Toddler Mental Health Coalition of Arizona you are part of this rich national and international network of like-minded professionals. Two of our top selling products have had a facelift! All development takes place in the context of a relationship. These wheels are easy-reference tools for educating parents, caregivers, and professionals about early social and emotional development. Each stage�provides a glimpse into the world of the infant, toddler & preschooler, and guides interactions that promote nurturing relationships and healthy social-emotional development in children. 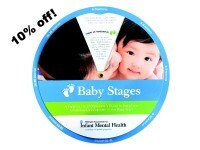 Baby Stages and Preschool Stages make great take-home tools for your early education class, home visiting program, pediatrician's office, and more. And, did you know every wheel has a handy magnet on the back? They stick easily on the family fridge so they're seen every day. Use code WHEELS10 to get 10% off now through the end of April!